Red Road Pass is a giant camp south-southwest of Dawnstar and due north of the Hall of the Vigilant. It is inhabited by one giant and one mammoth. When the camp is approached for the first time, three randomly-leveled bandits can be found attacking the giant and mammoth. 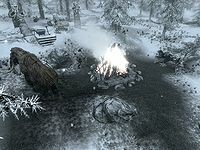 There is a large campfire in the center of the camp with three charred skeevers cooking on stakes. A large stone bowl and a set of steps are south of the fire; a mammoth cheese bowl and three large leather pouches filled with mammoth cheese can be found at the top of the steps. An unlocked chest with random loot can be found in a hollowed-out tree to the west. A patch of Namira's Rot grows next to the chest. The camp is decorated with the painted rocks, bone chimes, and mammoth skulls typical of giant camps. Several snowberry bushes also grow in the area. This page was last modified on 8 November 2014, at 00:22.